As a Denver portrait photographer, it’s important for me to make your photo session fun for the whole family. I want you to feel comfortable and relaxed so that your images convey that. With a background in photojournalism, I am a trained observer. I love to watch people interact in loving and intimate ways and because of that, I feel I am great at observing and capturing these moments for people with my camera. I want to share this passion and skill with people who also value this kind of photography and who want to forever capture these moments between them and their families. My experience as a news photographer has trained me to wait for and anticipate these special moments. I also want this experience to be a stress-free one for you and your family. I strive to make it that way so that you can enjoy your photo session and leave the work and worry to me. We will communicate before the photo session so that I know exactly what you want and make sure you are happy with the pictures we create together. I am originally from Cincinnati, Ohio and grew up in a family with several photographers. My dad was an amateur photographer with his own darkroom in my childhood home, and my uncle was a professional photographer and videographer for television. I guess this sparked my interest in photography, and throughout my teens I began to document my life with my friends and family. This has been an innate quality for me, to watch and enjoy people interacting with one another and to capture these intimate moments. I took this interest and decided to make it a career. I graduated from Kent State University in Kent, Ohio with a Bachelor of Science in Photojournalism. I worked as a professional news photographer for seven years. In college I placed as a semifinalist in the national William Randolph Hearst contest. As a professional, I’ve won several state and national photography awards. 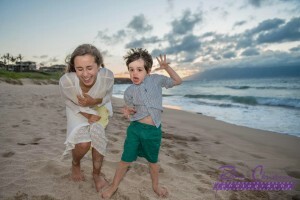 I lived on Maui from 2002-2017 and photographed family portraits, newborns, children, pregnant Moms, weddings, vow renewals and other special events. I recently relocated back to Denver and am specializing in family portraits and senior high school portraits. I use high-end professional digital camera equipment, Nikon digital camera bodies and lenses and Nikon’s Creative Lighting System. I also shoot Raw, large image sizes which ensures the quality of the image when it is printed. I try to utilize natural light as much as possible but also have portable on-location professional lighting equipment. My goal is to offer you the highest quality images that you and your family can cherish forever. These are important moments in our lives. Moments…fleeting, lovely, defining why we are here on this earth. And yet so often forgotten. Moments. That is why I do what I do. Watching and capturing moments as they unfold is my passion. It is my privilege to capture these special moments for you so that years from now you can look back at that photo and be brought back….back to that very special moment in time. To book a session with me or contact me for more information, click here.